The Rubber Plant (Ficus elastica) could be the ideal houseplant for you if you want a tough but easy going indoor plant that can reach staggering heights within just a few years. The shiny leaves look great in most homes and fill the space in an empty corner quickly. 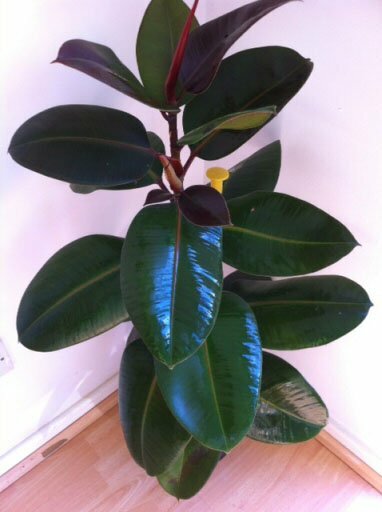 Even if you don't want to grow a really tall tree like plant indoors, the Rubber Plant's size can be restricted to an extend with regular pruning. 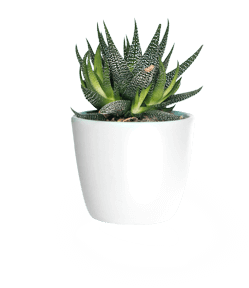 However you have to keep in mind these houseplants are determined to grow upwards, no matter what and don't stay small and compact forever, eventually requiring a certain amount vertical of space. You may find this plant labeled as a Rubber Tree or Rubber Fig. 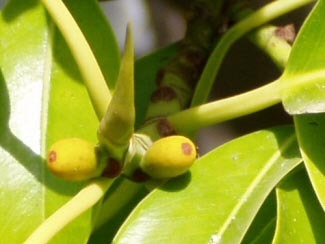 The "rubber" aspect of its name comes from the "rubber" white sap that oozes out of the glossy leaves and woody stems if they're scratched or cut. There is often so much sap, that there can be a drip factor which you need to be careful with. Also the milky latex is not particularly pleasant to humans or pets if the sap is swallowed. It's also an irritant to the eyes and skin so handle the plant carefully and if you do happen to get any on you, make sure you wash it off afterwards and you shouldn't have any issues. On the positive side of things, Dr Wolverton ranks the Rubber Plant as one of the very best houseplants to clean the air. It also scores really well with resistance to pests and diseases and has a high transpiration rate which increases the humidity of the room it lives in. 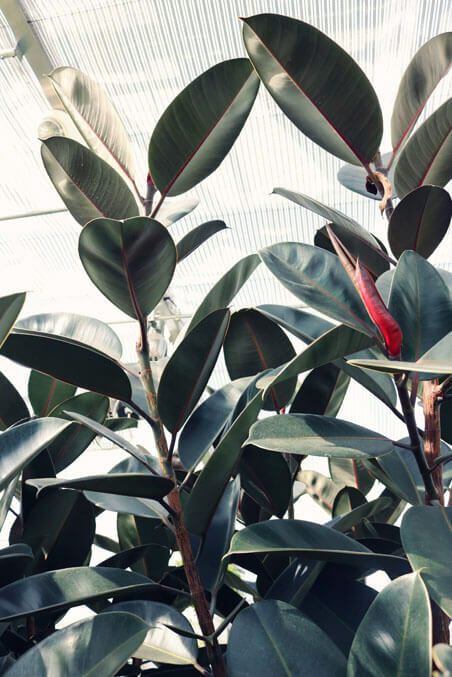 The true Latin name for this plant is Ficus elastica, however the traditional early versions have generally been replaced by more modern cultivars and closely related varieties. For this reason you might find the plant labeled as Ficus robusta (which as the name suggests is much more robust and hardy), other highlights include the compact Decora, and the dark green almost black leaved Black Prince. You might also come across some of the variegated types. These are harder to come by because they're trickier to keep looking great in homes as you can't skimp on the care requirement of bright light. 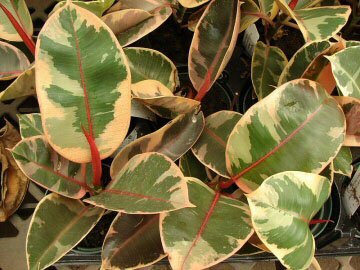 However, if you do happen to have a suitable place with good light levels for the variegated types, look out for Ruby which has pink and purple flushes in the leaves. Doescheri sticks with splashes of different shades of simple greens and yellows but still looks beautiful in the right spot. The most common variegated type is pictured further above, resembling army khaki. Grow away from continuous direct sunlight. 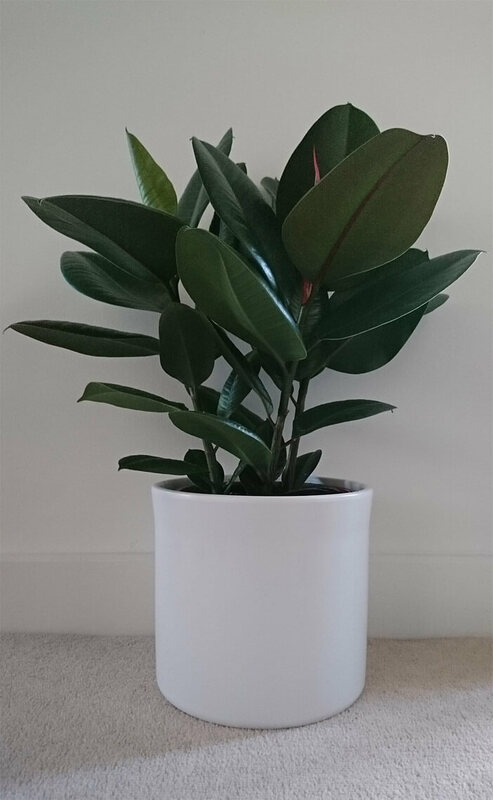 Instead give your Rubber Plant a well lit spot with some indirect sun if possible. The all green types will take some shade and poorly lit spaces, but too much for too long and the plant will become lanky and spindly. If you have a variegated type you must provide bright indirect light, otherwise If you opt for shade, you'll lose the markings. Rubber plants love a good soaking when they're growing, but dislike constantly damp roots. We've found the best way to treat them is to water your plant really well once the soil surface and top inch has dried out, then wait until it dries out in the same way before watering again. If you're watering more than once a week the Ourhouseplants.com Team are looking your way with narrowed eyes, questioning your technique. This might work for you and if it does keep doing it, but in most homes watering more than once a week is likely to frequent. 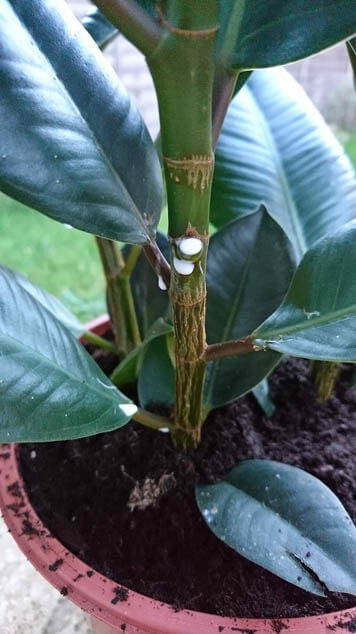 You shouldn't let a Rubber Plant sit in water, so after 30 minutes if there's still water remaining in the drip tray, pour it away. In Winter scale back and avoid the soaking, instead aim to keep the soil just moist. You can mist the leaves from time to time when the air is very dry, but really you don't need to worry about humidity levels. To produce those massive leaves the Rubber Plant needs feeding. Little and often is best, a weak balanced feed every couple of watering's during Spring and Summer. As with usual feeding rules, don't fertilise in Winter, or recently repotted and new plants for a good 3 to 6 months. If your plant's not producing new leaves don't feed at all. The Rubber Plant will be quite happy to grow in a broad range of temperatures between 10°C (50°F) to 29°C (85°F). If you go hotter, the leaves will lose some of their turgid appearance. You can go as low as 4°C (39°F) in Winter if you have to, but your watering must be spot on. If you've overwatered at this temperature you'll kill the plant quickly! These plants grow quite big even if their pots are tiny. These plants grow quite big even if their pots are tiny. However there will still come a point where the growth will slow down or even stop. You then have two choices, either move to a bigger pot using a standard potting mix, which will get the plant growing again. Or leave it where it is and top dress instead. Topdressing means scraping off the top inch or so of old soil and replacing with fresh compost which introduces fresh nutrients and beneficial microbes back into the old tired potting soil. To get started you'll need a piece of stem, (often a growing tip), it needs to be about 4-6 inches (10-15 cm) long. Remove all of the leaves bar one. If the sap is oozing wait until it stops (usually within 30 minutes) and then wash it off gently. Plant the stem with the remaining leaf in either gritty compost or perlite. You can dip the cut bottom end into a rooting hormone, but it's not essential. 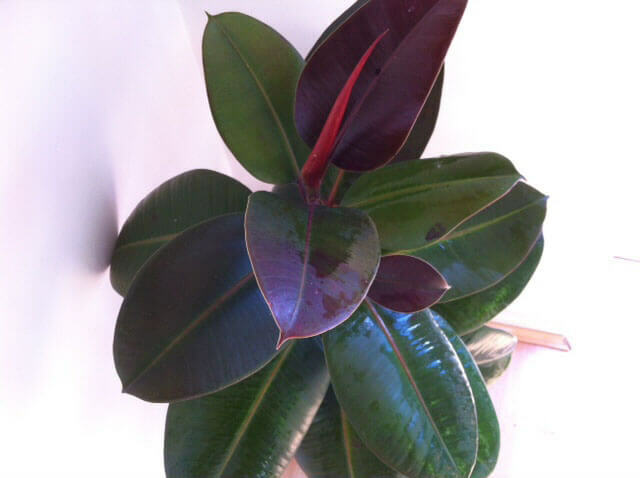 Growth of your Rubber Plant can probably be described as moderately fast. Many owners put their plants outdoors in the Summer which they feel encourages a rapid surge of new leaves. Don't over do the sun exposure though and watch out for wet cool Summers which can encourage disease and possible overwatering. Plants which are incredibly pot bound won't grow and don't expect any growth in the middle of winter as Spring and Summer are the growing months. The end height and spread depends on how well your plant is treated. Rubber Plants in good conditions, big pots and with no regular pruning can achieve upwards of 9ft / 3M. Poor conditions, small pots or pruning will result in a shorter plant. The width of the plant can be controlled through your choice of whether to prune or not. If you don't prune, the central growing stem will race for the ceiling unheeded giving a more narrow slender tree looking effect. If you constantly cut / prune this off, new growing tips will form at the sides of the central stem which will then create a branched, bushy looking style, resulting in a wider plant. In any event it won't spread wider than around 3ft / 1M in most homes. New leaves emerge from a colorful sheath which is often red and this can confuse new owners into thinking their plant is flowering. Ficus is part of the Fig family which as a general rule do not have bright, striking or fragrant flowers. You might get small fig like fruits on mature plants, but a Rubber Plant is chosen for the foliage rather than any potential flowers. 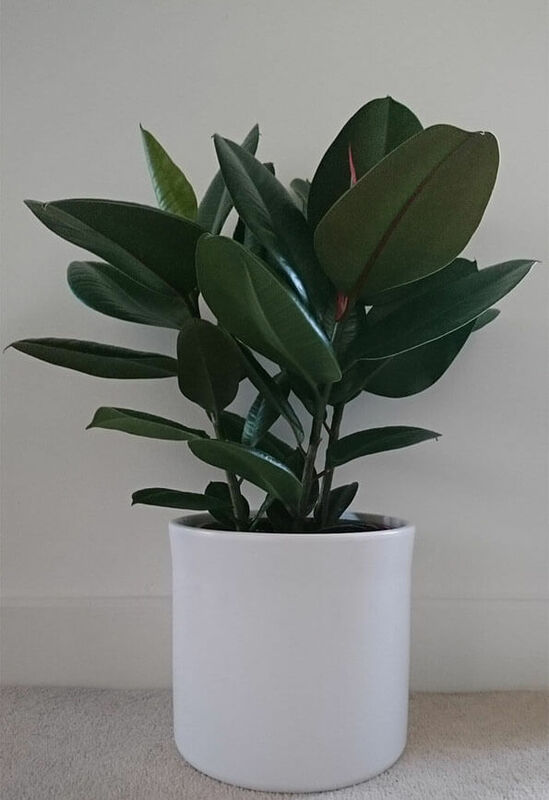 Yes the Rubber Plant is (mildly) poisonous to pets and humans. 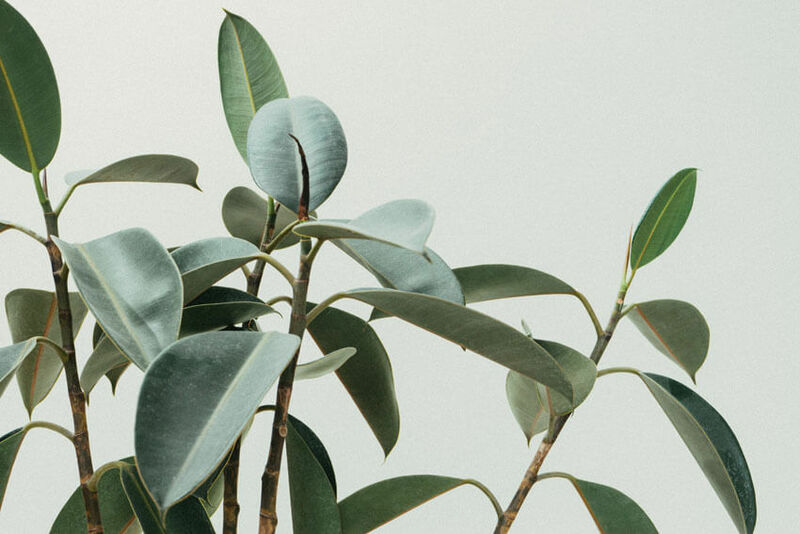 Many Ficus plants including F. elastica have a milky irritating sap in the stems and leaves that can cause gastrointestinal issues if eaten and skin irritation if the sap is allowed to rest on the skin for a time or gets into small cuts. Dust is the biggest problem for indoor Rubber Plants. You will need to rub them over every couple of months with a damp cloth to keep them looking great. Leaf shine products can also be used for a glossy finish. Good Light Avoid direct sunlight and very shady areas. Moderate Watering Once a week in Summer and once every two weeks in Winter. Feeding Try to fertilise once a month when it's growing. This is normal for very old leaves. Otherwise it could be a sign of over watering or not enough light. This can happen when temperatures exceed 29°C (85°F), or when you've over watered. Extreme cold, such as exposure to frost, can also cause this appearance, however the leaves won't return to normal after a few days and will quickly start to fall off the plant instead. A little knock or a little cut on a leaf or a stem can result in a large amount of dripping sap. This can fall onto the leaves below and dry out giving the impression something strange is happening. The sap, whether it's still wet or has dried out can just be wiped away from the leaves with a damp cloth. Always take care when repotting or moving your Rubber Plant. The sap, as well as being mildly toxic and irritating, can be damaging because it can stain carpets or furniture. Yes Rubber Plants do get big don't they! Fortunately they can be pruned without adverse effect (although you may need a step ladder to get into the canopy first!). Find the central stem and then cut where you're happy for the new top to be. You might have to wrap the exposed stem for a few hours to stop the latex sap from dripping all over the place. Afterwards two things should happen, firstly a new growth point takes over and it continues its rise upwards, or if your plant is really healthy you will get two (or more) new growth points. This results in a more bushy and branched plant. Use this pruning knowledge to design your perfect Rubber Plant! They might look like pests, or a disease, but these dots are actually perfectly normal and no treatment or special care is needed. Pests are rare because the Rubber Plant is so resistant to them. However you can still expect Spider Mites and Scale insects to drop in from time to time. 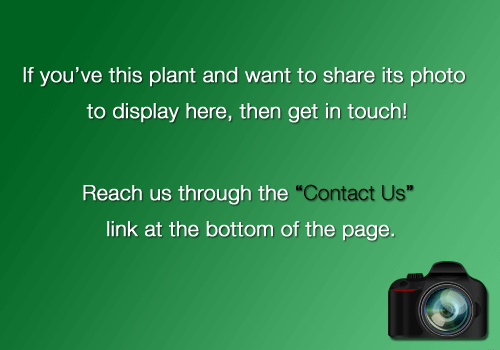 Our website is all about Houseplants. Packed full of Care Tips, Instructions, How to Guides and Plant Profiles. We're constantly growing and sharing knowledge so feel free to Follow Us on Social Media or Bookmark the site. If you've any Comments or Suggestions we'd love to hear from you.